Watching the ruling party in action is getting hilarious. In the 8 years that it was in power, it pretended to sleep, just long enough to sneak out and loot and plunder but seeing how its days are numbered, its trying to make amends. And how! While I agree it took two American newspapers to do what Aaj Tak and India TV couldn't, it looks like the government machinery has been fed and oiled sufficiently to give a punch or two before it falls. 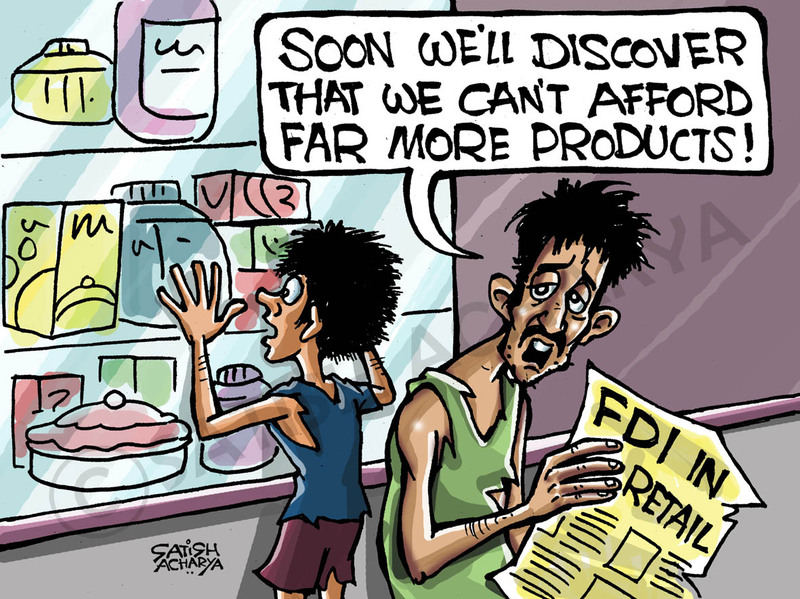 Among the slew of welfare schemes that were announced, the UPA decided to gift us what we have asking for all these years - FDI in retail. But with the Congress and its uneasy bed-fellows readying to pass a litmus test in Rajya Sabha, this could be an exercise in futility. We'd probably not live long enough to see the economic benefits of foreign moolah. Take China for instance, when the authoritarian communist government there decided to open its market to foreign investment, retailers of the world hurrayed in unison. They couldn't wait for a piece of the fat Chinese pie. A decade down the line, major retailers are shutting down stores and consolidating their businesses. One of the common arguments is that they over-estimated their potential and over-stayed their welcome. Chinese consumers were simply not the same as the Americans back home. We aren't that different either. From the Chinese. We love a bargain. But can a videshi Big Bazaar keep us coming back? Maybe we have more discerning consumers here than in China, but I can confidently say that we have not been studied yet. 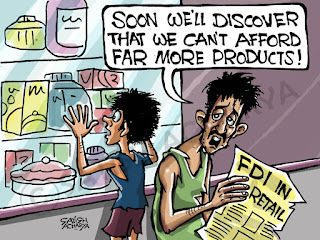 I support FDI and I think India needs to open her economy up. But we need regulators that must be impartial and prudent. 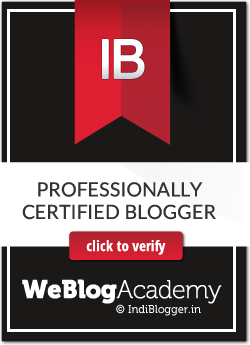 We cannot be the one stop for developed economies to dump their Grade B products. We should not be allowed to be a capitalist's guinea pig. But then who's listening to a lone voice? There's billions at stake here and while Walmart digs into its deep pockets to lobby, I have that distinct feeling that we are being offered as bait.